Backaches and sore joints can be treated using its bark, leaves and fruits. Rheumatism can be treated using the fresh leaves while their juices are used to treat diarrhoea. Intestinal worms can also be expelled by ingesting the seeds. The wood is used to construct boats and huts. Botanical Name: Barringtonia asiatica (syn. : Barringtonia speciosa, Barringtonia asiatica). 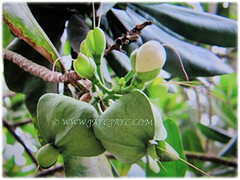 Common Names: Poison Fish Tree, Fish-killer Tree, Beach Barringtonia, Sea Poison Tree, Box Fruit, Putat Gajah/Laut in Malay. Etymology: The genus Barringtonia was named in honour of Hon. Daines Barrington (1727-1800). The specific epithet asiatica asian: referring to the natural distribution of the plant. Origin: Native to Tropical Africa, Madagascar, India, Indochina, Taiwan, Malaysia, Singapore, northern Australia and the Pacific Islands. It is cultivated elsewhere around the globe. 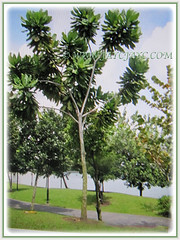 Plant type: An ornamental and perennial tree. 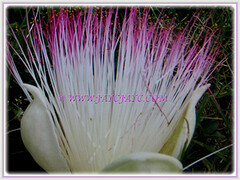 Features: Barringtonia asiatica is from the genus, Barringtonia that comprises of 57 accepted species. 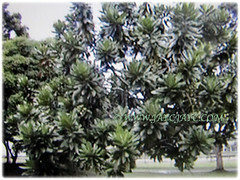 It is a small to medium-sized tree with a rounded crown that grows between 7-25 m tall. The unbuttressed trunk has pinkish-grey bark. Fruit produced as mentioned earlier, is otherwise aptly known as the Box Fruit, due to distinct square like diagonals jutting out from the cross section of the fruit, given its semi spherical shape form from stem altering to a subpyramidal shape at its base. The fruit measures 9-11 cm in diameter, where a thick spongy fibrous layer covers the 4-5 cm diameter seed. The fruit is dispersed in the same way as a coconut by ocean current and is extremely water-resistant and buoyant. It can survive afloat for up to fifteen years. Its leaves are narrow obovate, 20-40 cm long and 10-20 cm wide. 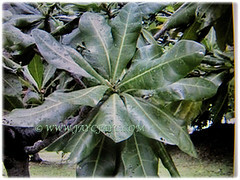 The spirally arranged, stalkless leaves possess leathery leaf blades that are shiny dark green, drop-shaped. 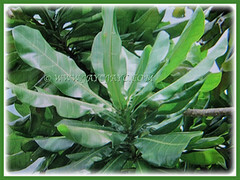 Its fresh leaves are pinkish-olive with distinct pink veins and wither yellow to pale orange. Its large pinkish-white and pompon flowers give off a sickly sweet smell to attract bats and moths which pollinate the flowers at night. Its flowering shoots are up to 31 cm long, found at the ends of branches and more or less upright, unlike the hanging ones typical of other Barringtonia species. Its stalked flowers are bisexual, 15-cm wide and appear fluffy because of the presence of numerous, white, pink-tipped stamens. Its strongly fragrant flowers open around sunset in ones or two, in readiness for the nocturnal animal pollinators. 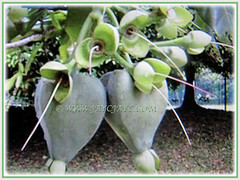 Its 1-2-seeded fruits are 7-10 cm wide with a broad square base tapering to two rounded sepals. The fruits mature from green to brown. They hang from branches and have a tough, corky-fibrous husk that aids in their dispersal by water. Its seeds are oblong and 4-5 cm long. Culture (Care): Barringtonia asiatica or Poison Fish grows easily with the least maintenance. Soil: Humus-enriched and well-drained soils. Others: All parts of the tree is poisonous. Seed is poisonous if ingested. The seeds have been used ground to a powder to stun or kill fish for easy capture suffocating the fish where the flesh is unaffected. Generally free from serious garden pests and diseases. For subtropical and temperate regions: Hardiness: USDA Zone 10b-11. Barringtonia asiatica or Poison Fish is a very critically endangered species. Best to grow in a large container to easily overwinter indoors or in a greenhouse with good lighting. Propagation: Easily propagated from seeds or by stem cuttings. Usage: Barringtonia asiatica or Poison Fish is a food plant for moth larvae of Dasychira spp. and Thyas honesta. Fruit bats and night-flying moths are attracted to its flowers and act as pollinators. The cooked fruits to remove the saponins are edible. Backaches and sore joints can be treated using the bark, leaves and fruits. Rheumatism can be treated using the fresh leaves while their juices are used to treat diarrhoea. Intestinal worms can also be expelled by ingesting the seeds. The wood is used to construct boats and huts.